Searchytdau.com is the PUP that uses misleading techniques to prevent removal. Use Reimage to locate malicious components and get rid of them faster than with uninstall instructions. A full system scan blocks virus reappearance and prevents traffic to malicious domains. Searchytdau.com is a Yahoo based search engine created by Polarity Technologies. Despite its legitimate appearance, it’s not worth trusting. It spreads as a Search Swapper extension hidden in freeware or shareware packages, sneaks into the system unnoticed and hijacks each of the installed web browsers soon after the installation. Searchytdau.com virus is created for controlling user’s browsing sessions and generating revenue from advertising. 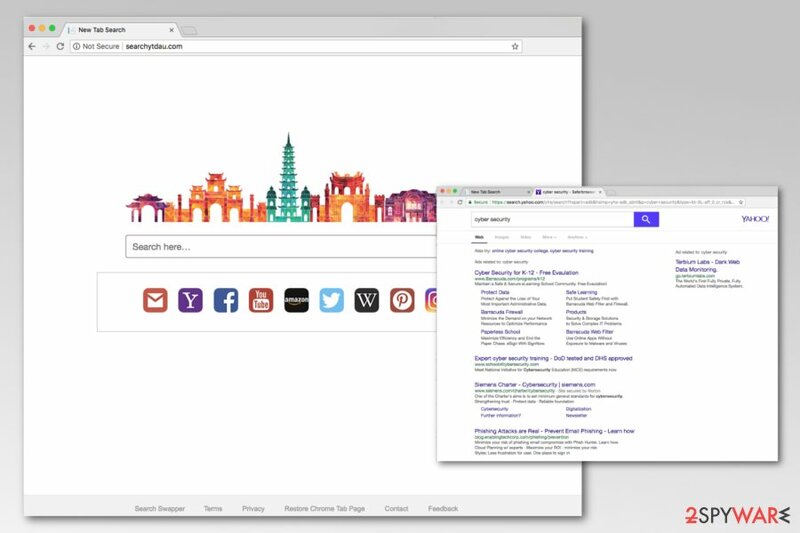 The search engine redirects search queries to Yahoo in order to create a legit-looking image. However, when users click on results or ads, they might be rerouted to highly suspicious third-party sites. As you can see, Search Swapper virus is capable of triggering redirects which not only diminish browsing experience but might force to visit dangerous sites too. Some links or ads might lead to phishing, tech support scam, virus infected or other deceptive websites. Hence, keeping this application on your device increases the risk of cyber attack. Additionally, Searchytdau.com tracks various information about users and possibly shares aggregated details with third-parties, such as advertising networks, unknown companies or individuals who have shady purposes how to use it. However, Searchytdau.com removal might not be simple. This browser hijacker is capable of making changes to the system, altering Chrome, Firefox or other installed browser’s settings, installing helper objects and performing other tasks necessary for keeping this program installed. Fortunately, you can terminate these problems in two ways. Firstly, you can remove Searchytdau.com by following our manual elimination guide given below. Secondly, you can let the anti-malware software clean the device for you. If you are interested in the latter method, we recommend launching a free scan with Reimage right now! Searchytdau.com is a suspicious search engine that can force you to browse through insecure websites. The primary distribution method of the hijacker is software bundling. As we have mentioned at the beginning, this potentially unwanted program (PUP) spreads as a browser extension attached to freeware or shareware. Hence, software bundling technique helps to get into the system unnoticed. Searchytdau.com hijack can occur when installing freeware using Quick/Recommended settings. According to the researchers from NoVirus.uk, the majority of users rely on them; however, it’s a bad habit. These settings do not inform about third-party programs suggested to install together with the primary program. To avoid unwanted apps, you have to use Advanced/Custom settings and monitor the installation. Opt out all suggested additional applications that might not be safe to your PC. However, if you want to remove Searchytdau.com manually, you should find our removal guide below handy. Please follow each of the steps attentively. If the hijacker comes back, please switch to automatic elimination option to clean leftovers. Here, look for Searchytdau.com or any other recently installed suspicious programs. Wait until you see Applications folder and look for Searchytdau.com or any other suspicious programs on it. Now right click on every of such entries and select Move to Trash. When in the new window, check Delete personal settings and select Reset again to complete Searchytdau.com removal. Reset Microsoft Edge to clean all hijacker-related components. Once these steps are finished, Searchytdau.com should be removed from your Microsoft Edge browser. Here, select Searchytdau.com and other questionable plugins. Click Remove to delete these entries. Now you will see Reset Firefox to its default state message with Reset Firefox button. Click this button for several times and complete Searchytdau.com removal. Here, select Searchytdau.com and other malicious plugins and select trash icon to delete these entries. Click Reset to confirm this action and complete Searchytdau.com removal. Here, select Extensions and look for Searchytdau.com or other suspicious entries. Click on the Uninstall button to get rid each of them. Here, look at the Homepage field. If it was altered by Searchytdau.com, remove unwanted link and enter the one that you want to use for your searches. Remember to include the "http://" before typing in the address of the page. Now you will see a detailed dialog window filled with reset options. All of those options are usually checked, but you can specify which of them you want to reset. Click the Reset button to complete Searchytdau.com removal process. This entry was posted on 2018-05-10 at 01:35 and is filed under Stealing programs, Viruses. You can quickly scan the QR code with your mobile device and have Searchytdau.com manual removal instructions right in your pocket. How did you remove Searchytdau.com?